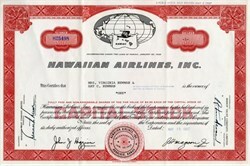 Beautifully engraved certificate from the Hawaiian Airlines . This historic document was printed by the Jefferies Banknote Company and has an ornate border around it with a vignette of the old company logo. This item has the printed signatures of the Company’s President and Treasurer. Hawaii's largest airline since its founding in 1929, Hawaiian Airlines today serves 14 domestic and international destinations in the Pacific region. It specializes in air transportation among the Hawaiian Islands and bringing visitors to Hawaii from points in the Western U.S. and the South Pacific. Carrying more than 6 million passengers a year, Hawaiian Airlines provides high-frequency jet service daily to seven destinations on six Hawaiian Islands and weekly service to the South Pacific destinations of Tahiti and American Samoa. In North America it provides daily service to Hawaii from Los Angeles, San Francisco, Seattle, Las Vegas, and Portland, Oregon. A pioneer of Pacific aviation, Hawaiian Airlines was incorporated on January 30, 1929 under the name Inter-Island Airways Ltd. On November 11 that same year, thousands gathered at Honolulu's John Rodgers Airport to witness the departure of Hawaii's first scheduled interisland flights: Inter-Island's inaugural flights to Maui and the Big Island of Hawaii. Two eight-passenger Sikorsky S-38 amphibian planes thus began three weekly round trips between these destinations. The airline continued to modernize its fleet as aviation technology advanced. In 1935 larger, 16-passenger Sikorsky S-43s were added to accommodate increased traffic and newly authorized interisland airmail service. In 1941 Inter-Island changed its name to Hawaiian Airlines and introduced the 24-passenger DC-3 into Hawaiian skies. This "workhorse" of the piston era was the mainstay of the airline's fleet for many years. It became vital during wartime operations when all interisland traffic was placed under military control. Granted the very first air cargo certificate issued by the Civil Aeronautics Board, Hawaiian Airlines provided an aerial lifeline to Hawaii's Neighbor Islands during World War II. In 1952 Hawaiian continued to lead in interisland air transport with the introduction of the Convair 340, providing Hawaii with its first pressurized, air-conditioned cabin service. The airline later purchased a long-range four-engine DC-6 aircraft for military charter transpacific flights in 1958. The advent of commercial jet service in the 1960s resulted in increased air traffic to and from Hawaii. Hawaiian grew to accommodate the travel needs of a growing residential population as well as an expanding visitor industry. In 1966 the airline brought to Hawaii its first pure jet interisland aircraft, the McDonnell Douglas DC-9. Travel time between the islands was reduced to a mere 20 to 30 minutes. The DC-9 remains the backbone of Hawaiian's mixed interisland fleet, Hawaii's best answer to the travel needs of residents and visitors alike. In 1984 Hawaiian began to provide worldwide charter services with three long-range DC-8 jets. Soon after, scheduled service began to Pago Pago, American Samoa and Nuku'alofa, Tonga. A year later Hawaiian acquired five Lockheed L-1011 widebody aircraft for scheduled and charter service. June 12, 1985 marked the inauguration of Hawaiian Airlines' scheduled widebody jet service between the West Coast and Hawaii with daily flights to Los Angeles. Daily flights between Hawaii and San Francisco and Seattle started in January, 1986. Service to Western Samoa soon followed. In 1987 Hawaiian expanded its South Pacific service by inaugurating flights to Tahiti, and Rarotonga in the Cook Islands. South Pacific service was scaled back in 1993 with the retirement of DC-8 aircraft used on these routes. In 1990 the international travel and hospitality publication Condé Nast Traveler rated Hawaiian Airlines one of the world's safest airlines. In an exclusive 20 year study (August 1990 issue), Condé Nast noted that Hawaiian was one of only five U.S. carriers, along with four with relatively short histories, that had never had an air fatality in their entire histories. Eleven years later, Hawaiian's record of safety continues unbroken. In late 1993 Hawaiian Airlines entered into a series of marketing and services agreements with American Airlines' parent AMR Corporation. Consequently, Hawaiian in 1994 converted its reservations and operating computer system to American's SABRE system, became a participating carrier in American's AAdvantage® Travel Awards program and replaced its entire widebody fleet of Lockheed L-1011 aircraft with DC-10 aircraft provided and maintained by American. In 2001, Hawaiian operates a fleet using McDonnell Douglas DC-9s on Hawaii interisland routes and DC-10s between Hawaii and the mainland U.S. and South Pacific destinations. The company has taken delivery of three of 13 new Boeing 717-200 aircraft that will completely replace its DC-9 fleet in 2001. Hawaiian has been rated one of the "10 Best" U.S. airlines by readers of Conde Nast Traveler and Travel & Leisure for the past several years and this year was rated the top U.S. airline for "Premium" class service in the 2001 Zagat Survey. In addition to a consistently high rating by discriminating travelers, Hawaiian's service has won several international honors. "Hawaiian Skies," the company's onboard video program highlighting the people and culture of Hawaii, earned a Bronze World Medal at the 42nd Annual New York International Film and Video Festival in 2000 as well as the Avion Award for excellence from the World Airline Entertainment Association (WAEA) in 1999. In 1998, Inside Flyer magazine rated HawaiianMiles, the company's frequent flyer program, one of the best in the world. In 1997, the International Inflight Food Service (IFSA) awarded Hawaiian its highest honor, the President's Award, for the company's Coach class service between the West Coast and Hawaii. The company had already won the coveted OnBoard Services Award for innovation and excellence in First Class service on West Coast-Hawaii flights. Hawaiian continues to build on an unbroken 71-year record of safety and to date has transported more than 120 million passengers. Hawaiian is the only airline able to provide single-carrier service from the Western U.S. and the South Pacific to each of Hawaii's islands. On board, passengers are surrounded with the gracious warmth unique to the people and culture of the Islands. Visitors to Hawaii are able to begin their vacation the moment they step on board a Hawaiian Airlines aircraft. History is from Hawaiian Airlines literature.